For Dorcas, “photographer” has very interesting connotations, conjuring up a figure who has an affinity to the more technical aspects of using a camera. “It’s a work in progress, but I will say I use photography as a medium to convey what I want to and to tell stories.” “Storyteller” or “visualizer” are more fitting terms to describe Dorcas at this junction in her life. She is currently telling the story Los Paisanos del Puerto: Living Narratives of the Chinese Diaspora Community in Puntarenas, Costa Rica. This story, told through a series of specially curated photos, visualizes the historical, yet often marginalized narratives of a Chinese Costa Rican community. As children of the Chinese diaspora, Dorcas and I know very well the struggles that come along with our multivalent identities. “I’ve always grappled with the question, am I Chinese or am I Malaysian?” she said. “I never felt sufficient enough to be both. I think that is always something us diaspora folks grapple with.” Though we come from different diasporic spheres—I am Chinese Filipino American and Dorcas is Chinese Malaysian—we both understand the importance of resisting the construction of monolithic narratives around identities. 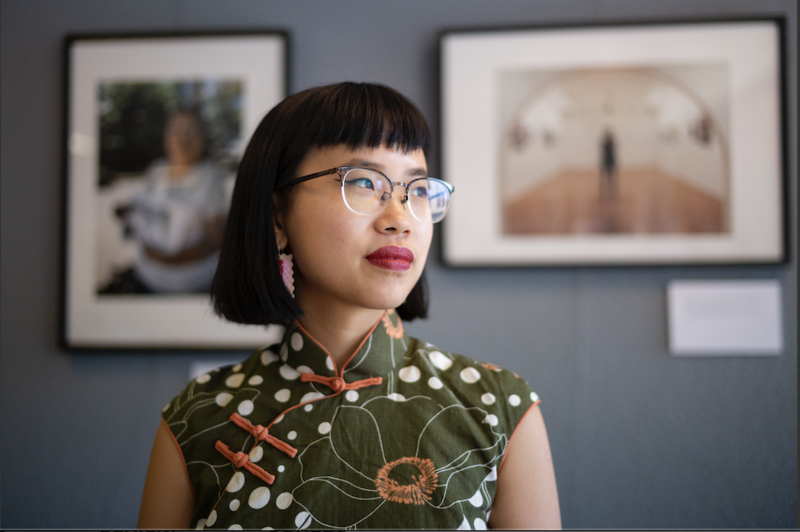 With this framework in mind, Dorcas traveled to Puntarenas, Costa Rica to not only prove a point that identities coalesce on multiple axes, but also to discover something about her own identity as a Chinese Malaysian and as an artist. Executing a photo project like Los Paisanos del Puerto was a laborious process, spanning from research to post-production and requiring a vast amount of time for planning. “I don't think people realize exactly how much work goes into a project like this,” Dorcas said. “The inklings of it began when I was studying abroad in Costa Rica and I came across a book about anti-Chinese racism in Mexico called Chino, by Jason Oliver Chang. I was like, ‘Woah, I didn't know there were Chinese people in Mexico,’ because I had never heard of that before.” An idea was immediately born. One thing led to another, and Dorcas got in contact with academics working on research of the Chinese community in Puntarenas. Eventually, Dorcas did manage to choose fifteen photos for display, and these fifteen shots give a fascinating glimpse into the everyday lives of the Chinese people living in Puntarenas. Luxuriating in the mundane, Dorcas’s photos show students playing basketball, a woman twirling in a vibrant dress, a family together at the dinner table, and much more. “Narratives don’t always have to be one of struggle and bitterness; it can be about celebrating this life and this place.” These photos are not meant to replace the forgotten histories of the Chinese in Puntarenas, but they do reveal a snapshot of community life told from Dorcas’s point-of-view. Los Paisanos del Puerto will resemble a traditional photo exhibition, but with a few twists. “There is going to be a case full of old photos, showcasing the history of this life, and I included this element because I love old photos,” she said. “Another key component is the audio interviews, because it is really important for me that they are still the ones with the agency to tell their own stories.” Here, Dorcas is getting at the notion of the power and its relation to photography. Photos can reveal as much as they conceal, so having the photographic subjects speak on their own terms is a way to alleviate that limitation. In this way, Dorcas is using photography as a means to conduct her own social justice work.